I don’t make it a practice, in my weekly commentary, to discuss what I do for a living, and I’m not going to start today. All I can tell you is that I am not in the investment business. I’m not a broker. I don’t work for a public company. I don’t sell investments. I have no vested interest in any of the commodities or companies I discuss (except as a shareholder, like most of you). I do, however, have the opportunity to meet with a wide cross section of people, and this week I had in my office a lady who operated a hair cutting operation, what used to be known as a “barber shop”, but is now referred to as a “salon”. The company is targeted at a mostly male clientele, with the sales pitch being “no waiting”. They have lots of barbers (“stylists” I guess is the correct term), so you can walk in, get your hair cut, and be gone; no waiting. I said that that sounded appealing, but there is one obvious flaw in that business plan. The flaw is that men don’t like change. I myself went to the same barber shop for about the first 25 or 30 years of my life; it was the same barber shop my father went to. I moved out of town, found another barber, whom I stayed with for a year or two until my wife told me it was time to find a real barber, so she took me to her “stylist”. I was somewhat freaked out going to a “girls” hair salon, but as those of you who are married to women will understand, the simplest strategy is to always do whatever your wife wants, and I did. Daniel is now my stylist. Daniel’s “salon” is a two minute walk from my office, and I now have a standing appointment, every third Tuesday at 2:00 pm, when he is least busy, for a hair cut. I’m in and out in half an hour; it works for me. The irony is that my wife no longer goes to Daniel. She found someone else closer to home. Women are fickle. They change stylists every six months. Men are lazy. We stay with the same guy forever. I’m sure if I still lived within an hour of the town I grew up in, I’d still be going to the same barber. My father still lives there, and he still goes to the same barber. I think next year he will be celebrating about his 40th year at the same barber shop. As for me, it would take a huge paradigm shift for me to switch barbers. Daniel would have to go out of business for me to have the inclination to source out a new stylist. Does that make me lazy? Resistant to change? Stubborn? Remind you of anyone? (Other than yourself)? It reminds me of the markets. (See; aren’t you glad you kept reading; it turns out there is a point to my long winded and nonsensical stories). 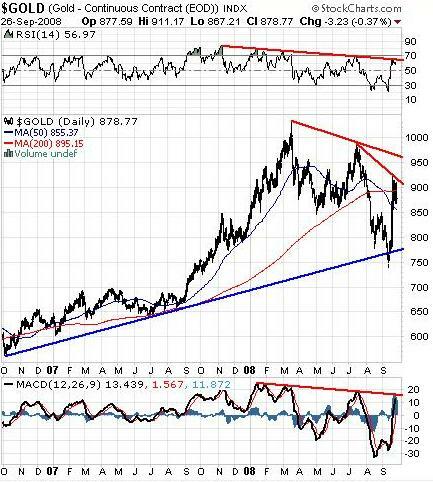 Two weeks ago gold was substantially higher, as the U.S. government was nationalizing the mortgage industry, and the U.S. Treasury was lending $188 billion per day to keep the U.S. financial system afloat. This week, as it appeared that a bailout package was imminent, the pressure on gold eased, and gold was lower as the week progressed. 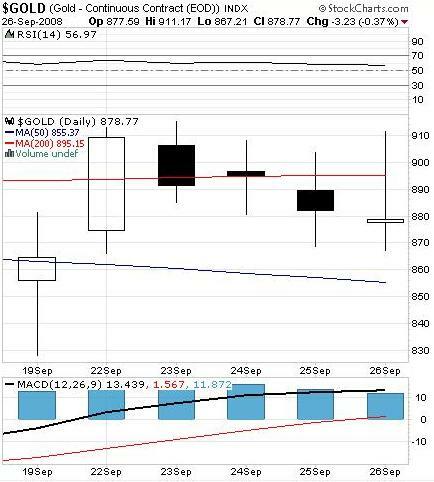 As you can clearly see on the last five bars of this chart, gold remained locked in a range of roughly $875 to $910 all week. This lack of a buying frenzy in gold is remarkable, because people are actually still buying U.S. dollars. The government has bailed out Fannie, and Freddie, and AIG, and a bunch of other guys, and is printing $188 billion per day, and is about to implement, I assume, a $1 trillion bailout package, all of which totals a substantial portion of GDP. The U.S. dollar is now essentially worthless. Within the next few weeks I fully expect to read about the nationalization of the automotive industry, and billions in loans and grants to the construction industry, and presumably ever other industry in America. Investors seeking a safe haven in Gold Coins can expect to pay more than 5% above world prices at even the largest North American dealers. Kitco.com of Toronto has been forced to stop selling “until further notice” one- and 10-ounce Gold Bars, and a range of unavailable silver products. Go to your local coin dealer, or bank, and try to buy a one ounce gold or silver coin. They are sold out. The smart money is already accumulating physical gold. And yet, Wall Street left gold in a narrow trading range this week. It’s almost as though this mythical man expects the bailout to succeed, the US to stop printing money, and all to be right with the world. Sometimes we just refuse to change. We believe in the phrase “sound as a dollar”, and refuse to accept any alternative. The government will save us. Long live the government. We don’t like change, and we don’t want to accept the fact that the dollar is now worthless, and gold is our only logical alternative. Kind of reminds me of the guy who stays with the same barber for 25 straight years. My friends, the times are changing. The herd sees what you and I see. They see a bank failing every day. They see the government printing money. But they stand there and watch, because they don’t fully comprehend what’s happening. They assume that tomorrow will be just like yesterday. I went to that barber last year, and I will again next year. But, alas, that barber won’t be there tomorrow. The bank will have failed. The government will not have been able to print enough money to keep the economy afloat. Eventually everyone will realize that there is only one asset that cannot be printed by government, and is not at the same time someone else’s liability. It is amazing that, since May, when gold broke the $1,000 barrier, gold has been in a downtrend. We are resistant to change. We are lazy. We are stubborn. We honestly believe that the government can save us, that all will be right with the world, that gold is a barbarous relic. It’s not, and it’s time we get with the program. It is very possible, even likely, that the U.S. government will announce a bailout program, and the markets will rally. That will signal the last chance to get out alive, and to get into gold. Our foreign friends have already stopped buying American money, and without their support there is no where for the American dollar to go but down. I suspect there will be one more gold buying window in the weeks ahead, before we see $1,000 again, but I have decided not to wait. On Friday, I started accumulating. As this Goldcorp chart shows, a retracement to $30 is entirely possible, so that’s where I’ll place my stink bid for a few more shares. 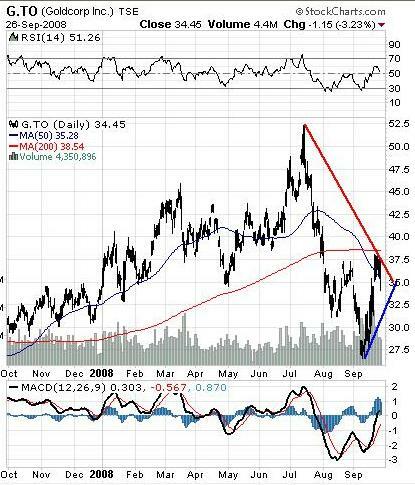 I could wait, but as this one year Goldcorp chart shows, we are nearing an important inflection point. The stock can’t be in a downtrend and an uptrend forever; something’s got to give, and I’m betting it will be to the upside. I also expect that at some point in the next few weeks the 50 Day Moving Average will cross over the 200 Day Moving Average, indicating an accelerating uptrend, and we know what happened last time that happened. 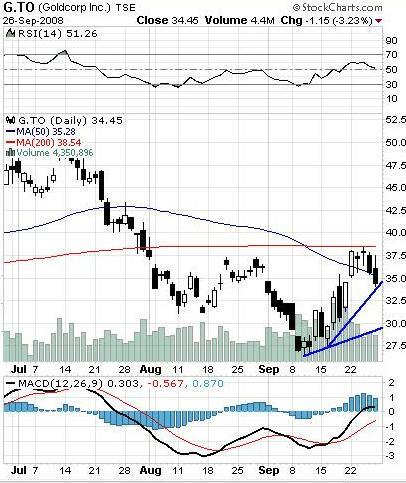 (Hint: look at the chart last November, the start of a sustained up move). I could wait, but I’m not going to get cute and try to pick the absolute bottom. I’m in, and now I will sit back and watch. Also, on Friday, just for fun, I bought some RIM.TO – Research in Motion Ltd. I’m a Blackberry user, and I know I’m not alone. Are we all going to stop using our Blackberry’s because the economy is in a mess? Probably not. In fact, that might make us use them more, as we constantly check for news and stock updates. 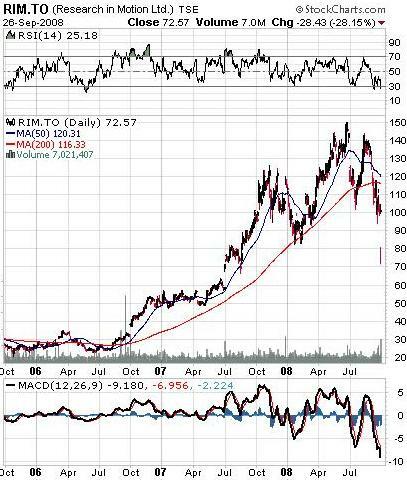 Call me crazy, but $75 looks cheap compared to the $150 per share we were at less than four months ago, and with the RSI down at 25, I think this is a good bet (although I’m only gambling with a small number of dollars; I’m not crazy). Finally, although I am buying the Big Boys, my biggest winners this week were the small stocks. Best on the week was AMM.TO – Almaden Minerals Ltd., up 18.8%, and FVI.V – Fortuna Silver Mines Inc., up 18.4%. The rush to safety will drive the big caps higher, but if you want a ten bagger, it’s going to be one of the little guys, so as they hit turbulence I will continue to increase my holdings. So, is now the time to buy gold, or should we wait for “The Big Puke” to totally decimate everything? Would silver be a better bet? Have we forgotten uranium, which indicates that’s where we should be? Or should we be avoiding stocks altogether, and rushing towards bullion? Tell me what you think. To help, I’ve added a new board on the forum, where you can post your comments on my weekly commentary. If you think I’m crazy, feel free to say so, but give your reasons so we all can learn. Also, feel free to click on the “share this” link at the top of this page, and at the end of this post, if you think others would benefit from my ramblings.